With “Cucumbers and Sanbaizu (a mixture of vinegar, soy sauce and sugar)”, you can make vinegared cucumbers. 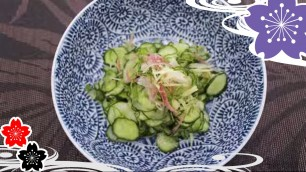 With “Cucumbers and Sanbaizu (a mixture of vinegar, soy sauce and sugar)”, you can make vinegared cucumbers. When you learn how to make it, you can apply the process to various vegetables or other foods. When you add spice, you can also enjoy the very different taste. The easier way is to use sushi-vinegar instead of normal vinegar. The ingredients are cucumber, salt, sushi-vinegared, ginger, perilla leaf, and myoga. Boil kombu in 2 cups (13.52 fl oz) of water and take kombu before it is boiled. This soup is “kombu dashi”. Add the all ingredients of sanbaizu in the soup and boil up once and let the soup cool. Sprinkle salt on cucumbers and roll them strongly on the cutting board. Slice them thin and rub them with salt. Wash them. Wrap with towel or kitchen paper and wring out them lightly. Put the cucumbers in a bowl. Add 1/3 of sushi-vinegar and leave them for 10 minutes. Wring out cucumbers and remove the juices. By wringing, the flavor will fully come out. Pour the remained 2/3 of sushi-vinegar evenly. Mix them with chopped gingers and perilla leaves and add chopped myoga. ✍Once you remove the juice wringed out, it will be authentic flavor. With sushi-vinegared, you can make it more easily. On Japanese Recipes TV, you can learn how to cook delicious Japanese foods.